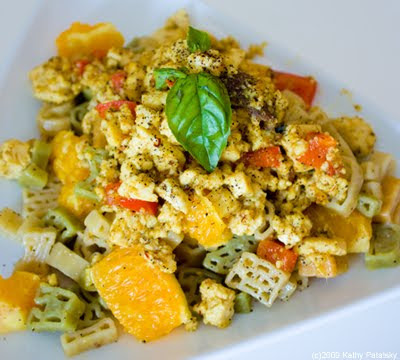 Tofu Scramble "Good Morning" Pasta! Got Energy? Breakfast Around the World. 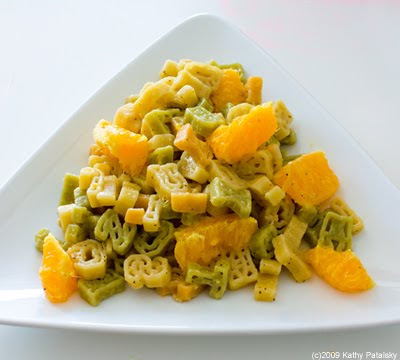 We usually don't think to add pasta to our list of stand-by breakfast dishes here in America. But sometimes it's a good idea to think outside the cereal bowl when it comes to eating well in the morning. All over the world folks are eating things other than cold cereal, donuts, toast and coffee. They are eating things like beans, rice, pasta and even fish and sushi! Check out my "Breakfast Around the World" post to learn more. Breakfast Pasta. 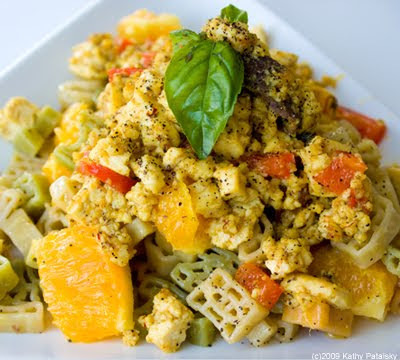 Pasta is a fabulous element for your breakfast menu! (No, you shouldn't eat a gigantic bowl of pure pasta.) Balance is key: Protein is a must! Healthy fats slow down digestion and add flavor. Pasta is great because it is high in energy yielding complex carbohydrates, and if you use a pasta that is spelt, whole wheat or veggie-dense, it will contain a boost of fiber (and nutrients) that will allow the energy to last you all morning and into the afternoon. Nutrition 101: complex carbs are better than simple carbs (like sugar in sweet cold cereals) because they combat the sugar-high and crash and burn effect of easily digested sugar. Why Not Just Bread? It's true that the basic components of pasta (carbohydrates) are similar to that of say whole wheat or grain toast, breads or muffins. But the big difference is the water content. Pasta is water dense and thus a better tummy filler than toast or dry cereal. It will warm you up and keep you feeling satisfied throughout the day. And adding a nice big scoop of scrambled tofu gives you that protein boost you crave in the morning. The protein also helps 'complicate' the nutrient profile of the meal-which is a good thing for optimal nutrition! After all, just a big 'ol plate of pasta is not my idea of a balanced meal. But add in the oranges, tofu and veggie accents and you are headed for the honor roll! 1) First make the pasta by boiling water and cooking the pasta until al dente, not mushy! The citrus oils will further soften the pasta. Drain pasta and place in large mixing bowl. 2) Add a splash of olive oil to the bowl and toss the pasta well. Next add in the Parmesan cheese to the warm pasta and continue to toss well. The warm pasta will soften the cheese bits and create a nice coated flavor. 3) Next, fold in your fresh orange juice and chopped orange slices. 4)Lastly, fold in the soy milk creamer and optional orange zest and black pepper. Cover the pasta and set aside while you cook the tofu. The pasta will soften up a bit during this time and the flavors will intensify. 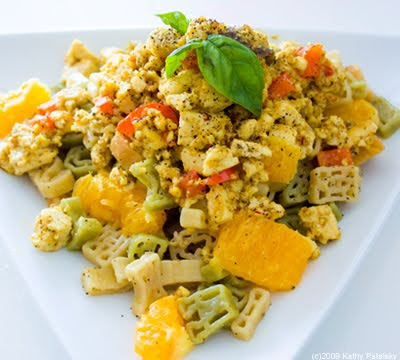 5) Next, it's tofu scramble time! First prep all your ingredients. Rub or drizzle a bit (1 tsp or so) of olive or canola oil in your saute pan. Turn your stove top to med-high. 6) Toss in the diced bell pepper. (You can even add in other veggies here, but bell pepper is a fabulous 'scrambled protein' ingredient because the flavor works well. Saute pepper until slightly crisped edges form. Turn heat up to high. 7) Add the orange juice, soy creamer and agave or maple syrup to your pan. 8) Add in the tofu. 9) Add in the cumin and soy sauce. 10) Cover pan with lid or foil and allow the steam to cook the tofu for a few minutes. Toss pan a bit to coat tofu in the liquid. 11) Uncover pan, grab a spatula and begin smashing the tofu into halves, bits and chunks. Use the edge of the spatula. Work the tofu around so that a nice sizzling saute begins. You want all the liquid to marinate into the tofu while steam burns off the excess liquid. 12) At this point you can add in your vegan buttery spread, a few dashes of fine black pepper and continue the saute. I added about 1 Tbsp, but you can certainly use less (or more) depending on your desired richness of the dish. Continue tossing and chopping with your spatula until a nice soft, yet caramelized tofu scramble forms. Again, all the liquid should be absorbed, but you don't want to dry the tofu out because then it turns to rubber. Not good. Practice makes it perfect. I promise. 13) Turn off the heat for plating. Add a scoop of pasta to each plate. Smooth it out flat so you can add your tofu over top. 14) Add a few pinches of chopped up fresh parsley or basil and more black pepper to the tofu. Toss the tofu a bit and plate over top the pasta. I garnish with some fresh parsley or basil leaves and a sprinkling of vegan parm cheese. Salt to taste, but the soy sauce, cheese and buttery spread already cooked in should be enough. Eat steamy warm. Yum Yum Yum. And yes, a slice of sprouted grain toast with a berry jam would make a nice compliment to this dish. 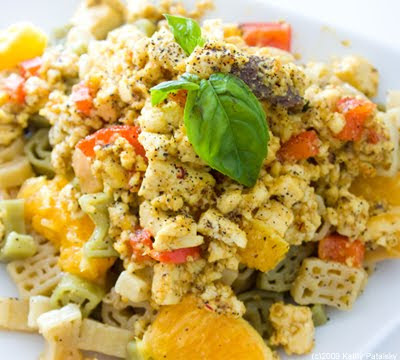 You can make scrambled egg and pasta sandwiches! But don't do overboard on the toast since you are already getting adequate carbs from the pasta. *If you do not have soy milk creamer, use basic full-fat (not low-fat) soy milk. Plus an extra dab or drizzle or canola or olive oil. You may need to use a bit more milk than creamer and then reduce it, let it cook/steam off, as you saute the dish. *Soy alternatives. You can easily use a hemp, almond or coconut milk to replace the soy milk in this dish. In fact, coconut milk is another great substitution if you are out of soy milk creamer. It is high in fat so you only need a very small amount. However, rice milk is too thin to work here. And if you are super soy sensitive, change up all the soy ingredients for a substitute. You can even use seitan instead of tofu, although the 'scrambled eggs' effect will not work with the brown color of seitan. But still high in protein and just as tasty. *Lower Calorie Version. You can certainly get away with adding even less fat to this dish by removing the buttery spread and/or olive oil. You will still need to grease the pan well, but the natural fat in the tofu will be enough to add some body to your scramble dish. I'd suggest starting out with minimal amounts of oil/fat and doing a taste test. You can always add more to your liking! *Fresh Flavor. Absolutely add in more veggies, herbs, spices or seasonings to this dish if you choose. 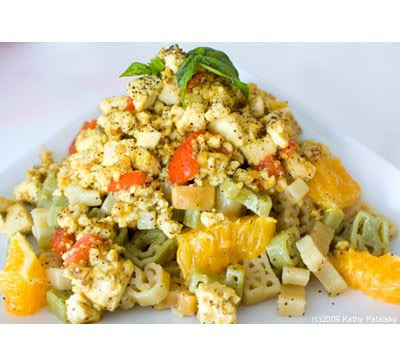 Pasta and tofu are highly flavor-absorbent ingredients with a naturally bland flavor. You can customize to your tummy's delight!